THIS PAGE IS UNDER CONSTRUCTION. Watch it grow and PLEASE COME BACK FOR A VISIT SOON! Purpose: To provide a structure for learning that actively promotes the comprehension and retention of knowledge through the use of engaging strategies that acknowledge limitations of capacity and processing. According to the GOOD STRATEGY USER MODEL (Pressley, 1986), a good strategy user is one who posseses a variety of strategies and uses these pedagogies to meet cognitive challenges. Rarely these strategies are used in isolation, but rather integrated into higher order thinking sequences that accomplish complex cognitive goals. Great teachers will know how to build the capacity of students as good thinkers, helping them learn when and where to use selected strategies. They will also understand the benefits of using strategies. The metacoginitive knowledge about strategies also helps the good strategy user determine the benefits in terms of effort. Students are most likely to utilize strategies when they have an awareness of how much they will improve performance. So teachers must explicitly teach this. Give students a chance to examine the infographic and then turn and talk to a neighbor to share their thoughts. 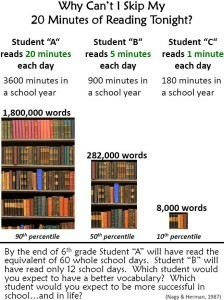 1) Honestly think to your self about how much you really read each night. 2) Do you think there may be a correlation between how much you read and the grades you get on your report card? 3) Why do you think they included the number of words read in this infographic? 4) How may building vocabulary be linked to success in school? 5) What structures do you have in place to protect your reading time at home? Where do you read, how do you make sure your time is uninterruted, do you have a quiet place to read, do you have routines in place? Strategy use gets easier with practice. So it is important for the teacher to share a few strategies at a time and teach them well and consistently throughout a school year. Teaching many strategies will only lead to superficial use and understanding of how to apply these strategies to higher order thinking challenges. So teachers should select strategies that can cross curriculums and contents and be intentional and purposeful in their use. There are MANY cognitive instructional strategies. Again, it is importnat to understand the importance of intensively and extensively teaching a few strategies at a time. You MUST MODEL how to use specific strategies, do not expect students to automatically understand how to use a strategy the first time even the second or third. Start with whole class instruction then gradually release responsibility to your students. you may find yourself continuing to model through small group instruction to students that are taking longer to grasp a deep and meaningful understanding of use. For READING comprehension, Common Core suggests CLOSE READING for gains in reading proficiency. 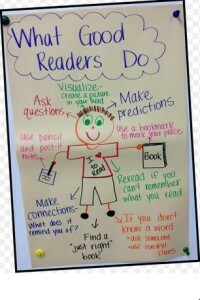 Teachers prompt readers to think about themselves as readers and thinkers. “What do good readers do?” is a popular question as teachers try to get students to thinnk about strategies that help them connect to text on a deeper and more meaningful level. Preview: Read the front and back cover. Scan the pages and look at pictures. Determine how the book is organized. Visualize: Make a movie if the text in your mind. Ask Questions: What is the main idea or central message of the text? Make Connections: What does this remind me of? Predict: What will happen next? Summarize: Put the main idea and key details in your own words. Infer: What clues does the author leave for me to determine more? Respond: Talk and write about what you have read: what parts did you like or not like, would you recommend this text to a friend? The Common Core standards suggest several genres of short text, both literary and informational, that can work at the elementary level. Many kinds of traditional literature including folktales, legends, myths, fables, as well as short stories, poetry, and scenes from plays all lend themselves to close reading. In CLOSE READING the strategy of reading with a pencil keeps the reader engaged and helps the reader pay attention to what they are reading as well as helps them remember what they have read. While this strategy is called reading with a pencil it can be done digitally using electronic apps for note taking such as Evernote, Google Notes, or One Note by Microsft. Or if the teacher uploads the text to a word document and shares it with students they can in turn make comments and mark up the selection as they read it on their digital device. The important piece for beginning this process is making sure you as teacher have a format you teach and consistently use throughout the school year. 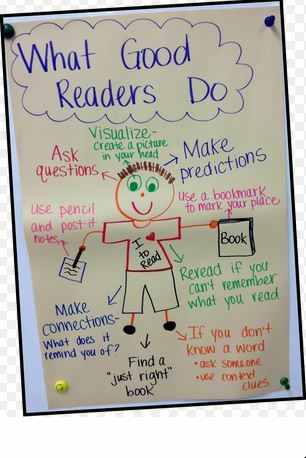 Even at the 2nd and 3rd grade level, students can “read with a pencil” by annotating with simple shapes or even stickie notes when they cannot write in the book. Check out this CLOSE READING bookmark on Teachers Pay Teachers for our all time favorite CLOSE READING symbols for the elementary level. CLOSE READING and QUESTIONING go hand in hand. There are many schools of thought on the right questions to ask, when to ask them and how. What we have learned over the years is that teaching students to think about their questioning helps them understand what they are reading. Explicitly teaching levels of questioning will help students gain greater depth of knoweldge.